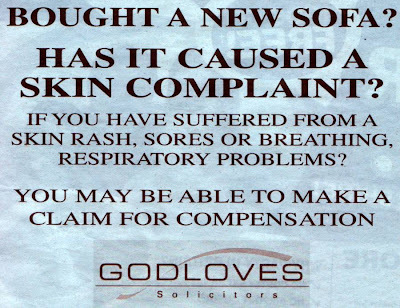 Are people really allergic to sofas? I had no idea. Frankly Lisa's life wouldn't be worth living. Which I suppose is why they need compensation. I must admit though, since finishing work and taking up residency in front of Jeremy Kyle, Lisa's experienced bruises, sores and shortness of breath. Never mind the late stages of pregnancy, I think we have a cast iron lawsuit on our hands.